Working in close cooperation with the customer, the package is designed and manufactured specifically for the application in question and delivered punctually. Since the Hot Half is fully equipped with all the hot runner components, the nozzles, and the clamping, bolster and nozzle retainer plates, as well as with standard components and connectors, it is ready for immediate use. 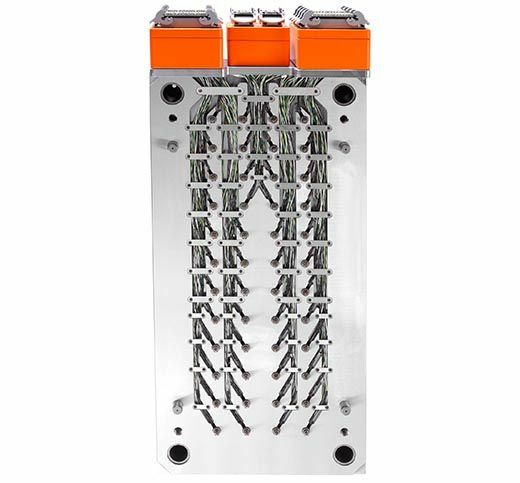 All the customer has to do is to attach the fully wired-up and ready-to-connect system to the other mould components. Once this easy task has been completed and the Hot Half is connected to the control and supply peripherals, the customer can start reliable production straightaway. HASCO tests all the electric components and, where appropriate the pneumatic or hydraulic drives, prior to delivery, making sure that they function properly, are correctly wired up and have the right zone allocation. In addition, all the relevant dimensions such as the hole spacing for nozzles, guides and centring devices, the nozzle tip position and the nozzle protrusion are checked in the assembled state on coordinate measuring machines, together with the installation dimensions. All the test results are documented in the corresponding reports. HASCO supplies detailed documentation with each Hot Half, including system drawings, parts lists, installation and maintenance instructions and a test report on all the heating units and thermocouples. The customer benefits from both highly reliable and safe application of the system thanks to its dependable and consistently verified quality. The Hot Half concept allows mouldmakers and injection moulders to considerably shorten design and production times for hot runner moulds. The design outlay at the customer’s company is kept to a minimum, and the time taken to manufacture the mould considerably reduced. This is made possible through HASCO’s rapid implementation of its customer projects. Immediately after coordinating matters with the application technology department, the Hot Half is designed to the customer’s specifications. The CAD data is then available in the desired format within a matter of days. HASCO delivers the complete Hot Half within three to six weeks depending on the complexity of the mould in question. During this time, the mouldmaker can focus on the inserts and the details of the mould. Having the work steps conducted in parallel releases mouldmaking resources and boosts productivity. HASCO assumes the full manufacturing risk for the H4400/… Hot Half and, through its finely tuned assembly of the nozzles and its precise alignment of all the parts, ensures a leak-free system with perfectly functioning components. The consistent use of HASCO connector components and HASCO control technology in combination with the Hot Halves further increases the guarantee period. Mouldmaking companies and converters are assured of functionally reliable hot runner technology, guaranteed by the manufacturer, together with greater cost-efficiency. HASCO provides a guarantee of correct functioning, combines cost-efficiency with rapid, worldwide service and thus permits more efficient and reliable work. The application engineers at this Lüdenscheid-based hot runner specialist are always pleased to advise customers and will configure Hot Halves in the optimum manner for the application in question.